Looking forward to that day when men and women are paid equally at work? You may be waiting a while. According to reports, no country in the world has closed the gender gap when it comes to salary. In India, the Monster Salary Index (MSI) on gender for 2017 revealed that women in India earn 20% less than men. The gap has narrowed by about 5% points from 24.8% in 2016; however the gender pay gap widens with experience and is highest at 25% for talent with 11 and more years of experience. As many as 69% women at Indian workplaces feel the management needs to “walk to talk” when it comes to gender parity. Over the years, teaching and nursing have become female-dominated professions while engineering and software development tend to be male-dominated. So choosing a career in software is sure to get you started on a higher salary than teaching kindergarten. Harvard labor economist Claudia Goldin has found that college grads moving into such professions can eliminate an average 30-35% of the wage gap. According to a study at Carnegie Mellon University, only 7% of women negotiate their first salary. Compare that to the 57% of men who make a case for better pay, and you see why women set themselves up for lower salaries and lower salary bumps through their work life. “A lot of getting ahead in the workplace has to do with being willing to raise your hand… If we as women don’t raise our hands in the workplace, we’re not going to get the same opportunities men do. Because men keep their hands up,” says Sheryl Sandberg, COO of Facebook, in Mika Brzezinski’s book, Knowing Your Value: Women, Money and Getting What You’re Worth. 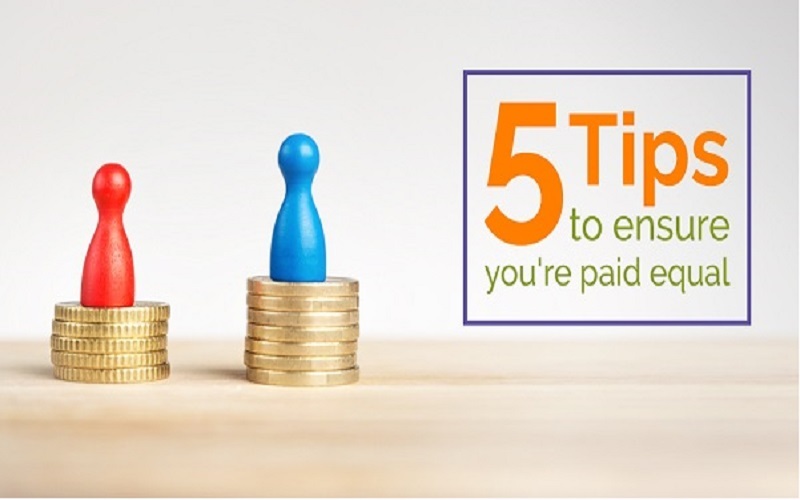 Failing to negotiate your salary from the start is a mistake that will follow you and be compounded over the years. So do your research to figure out what you are worth and make your ask. In her 2012 book, Pushback: How Smart Women Ask — And Stand Up — For What They Want, top leadership consultant Selena Rezvani discusses how women miss promotion opportunities, plum assignments, and higher pay by not negotiating. She says men not only initiate negotiations four times more often than women, they also set higher targets, and so benefit in the long run. “So while women attempt to negotiate equitably — so that the pie is split in half — men tend to ask for a larger part of the pie,” she says. It’s a fact that women find it tough to negotiate aggressively. When they do, it often tends to be held against them. Try being collaborative; using words like “we” and “our”, and trying to take the company’s perspective is often more effective to get yourself a pay raise. Early-career promotions are important to put women on the growth track, but women at entry level tend to be more likely than men to spend more than five years in the same role. PayScale, a website that provides information about salary, benefits and compensation information, states that women’s pay growth “stops outpacing men’s at around age 30, which is when college-educated women typically start having children”. So it makes sense for women to try and scale the corporate ladder before they start their family. Speaker, trainer and career consultant Emilie Aries advises painting a clear picture of what the future could hold for the company if you got the promotion. “Why would everyone’s lives be better if you got your promotion? Seriously, make the case for how you would be better equipped to do more for them,” she writes in an article. Ask for your supervisor’s time, make your case, and present it to the best of your ability. Women and tooting their own horn doesn’t go hand in hand. But, it’s imperative to get ahead. Peggy Klaus, a business coach and author of BRAG! The Art of Tooting Your Own Horn Without Blowing It, says: “Bragging is something that everyone needs to do.” A study at Northwestern University revealed that women’s tendency to downplay their successes at work may hold them back. Paola Sapienza, co-author of the study and a professor of finance at Northwestern’s Kellogg School of Management, writes: “Men tend to overstate how well they do relative to women. And the people who are making decisions after hearing everyone speak tended to take most people’s statements at face value. You’d think that people would discount what men say somewhat and inflate what women say about themselves. But in reality, they didn’t do that.” If you don’t want to just brag, take along a self-evaluation that spotlights your skills, achievements, and reveals how your performance has benefited the organization’s bottom line.